The Rambler 14 Oz. Mug is one of YETI’s toughest, most over-engineered camp mugs. 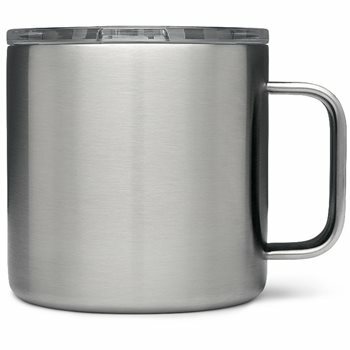 Unlike traditional camp mugs, the Rambler protects hands from hot or cold contents. The mug’s wide opening makes contents easily accessible while the full-loop Triplegrip Handle provides comfort for wider hands. The mug features Doublewall Vacuum Insulation and a lid so your contents will remain hot or cold until you’re good and ready. The 18/8 stainless steel construction is safe for the dishwasher and offers puncture and rust resistance.